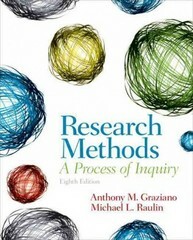 Research Methods 8 Edition Explores the entire range of research methodologies in psychology. This comprehensive text uses a carefully constructed programmatic approach to introduce topics and systematically build on earlier presentations. Research Methods emphasizes research concepts, as well as specific, technical research strategies, to help students develop an understanding of the underlying rational-empirical processes of science and gain specific research skills. The authors provide clearly written explanations of concepts and numerous examples drawn from all areas of psychology to enable students to develop a sophisticated understanding of the research process. The 8th edition includes an extensive integrated Web site (http://www.mikeraulin.com/graziano8e/) with a variety of resources for students. Learning Goals Upon completing this book readers will be able to: Understand the concepts of research design Develop research skills based on a knowledge of appropriate research design Develop a sensitivity to ethical issues in research and the skills necessary to address these issues Understand basic statistical concepts Note: MySearchLab does not come automatically packaged with this text. To purchase MySearchLab, please visit: www.mysearchlab.com or you can purchase a ValuePack of the text + MySearchLab (at no additional cost): ValuePack ISBN-10: 0205900925 / ValuePack ISBN-13: 9780205900923.